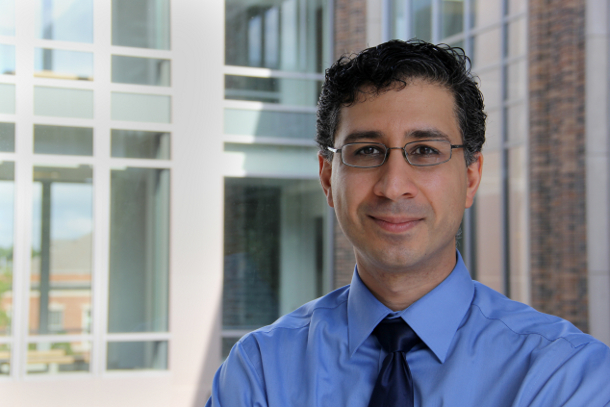 Sina Farsiu, an associate professor at Duke University with appointments in biomedical engineering, ophthalmology, electrical and computer engineering, and computer science, has won the 2017 Association for Research in Vision and Ophthalmology (ARVO) Foundation/Pfizer Ophthalmics Carl Camras Translational Research Award. Reserved for scientists under age 45, the award honors excellence in research and fundamental scientific discoveries, concepts and novel technologies. The discovery that each recipient is nominated for must also have led to, or have promise of leading to, clinical applications. Farsiu will receive the award, which includes a $12,000 honorarium, at the 2017 ARVO Annual Meeting held in Baltimore, Maryland. Farsiu’s research focuses on developing mathematical theory and computer software that make imaging systems better, either by improving resolution or how quickly pictures are snapped. His team also develops algorithms that can autonomously search through the avalanche of data that modern imaging technology produces to find new disease biomarkers or help clinicians make better diagnoses. Just a few applications of his work include finding novel imaging biomarkers for age-related macular degeneration, probing the visual system for early warning signs of Alzheimer’s disease, determining the best line of treatment on a personalized, case-by-case basis for diabetic retinopathy, the leading cause for blindness in working-age Americans, and developing cost effective imaging systems for detecting visual problems in premature babies. Translational scientists around the world have used Farsiu’s research in diverse areas of ophthalmology and vision science. These innovations are in the fields of image processing and machine learning, including groundbreaking work in developing automated software for segmentation of anatomic and pathologic features on optical coherence tomography images.